It was a leisurely day today – we spent most of it hanging around the house, playing, snuggling, showing off the garden. Julie, Grandmama, and I went to the Corn Wagon (our local farmer’s stand) and the grocery store to pick up some supplies for……. dinner!! Grandmama made an AWESOME dinner of arroz con pollo, my favorite. She taught me how to quarter the chicken (it was pretty decimated by the end of things), and mom and Julie and I were her sous-chefs. Here are some pics from today. So relaxing! Abuelo and Nomi taking a mid-morning nap. 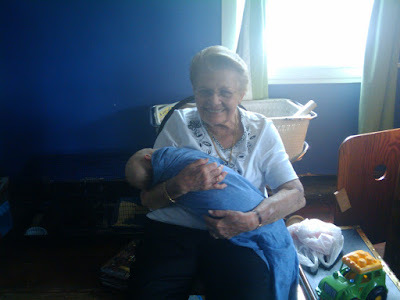 Grandmama cuddling her newest great-grandchild!